Following the re run election that took place last Saturday in Imo State, that returned the incumbent Governor of Imo State, Owelle Rochas Okorocha for a second term, the Independent National Electoral Commission (INEC) has given certificate of return to him amidst pomp and pageantry. The Governor drove on an open roof with mammoth supporters from the Government House on a long convoy to the INEC office along Port Harcourt Road, Owerri causing traffic gridlock for hours. Prof. Ebidapo Obe who is the returning officer gave the certificate of return to the elected Governor among other INEC officials including the Imo Resident Commissioner, Dr. Gabriel Adah. Greetings and long embrace of celebration among party faithful suffused the arena. Okorocha who drove round the municipality of the state acknowledged cheers, greetings and waving from Imolites. He however dedicated his victory to the downtrodden and the poorest of the poor in the state, while insisting that the free education which is the cardinal point of his administration will continue. He noted that more jobs will be created by establishment of factories in the state. 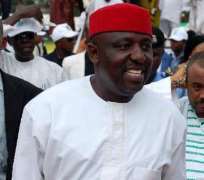 It would be recalled that Okorocha of All Progressives Congress (APC) polled 416,996 votes to defeat his closest rival Hon. Emeka Ihedioha of Peoples Democratic Party (PDP) who polled 320,705 votes and the margin of win was 96,291 votes.